The SUMMER COZY installation is happening at the St. Paul Saints! During the Monday game there will be Cozy Makers on hand to talk to guests about the project as they work on small pieces for a community wall. The commute may be a snowy mess, but downtown St. Paul’s light fixtures are looking warm and snuggly. 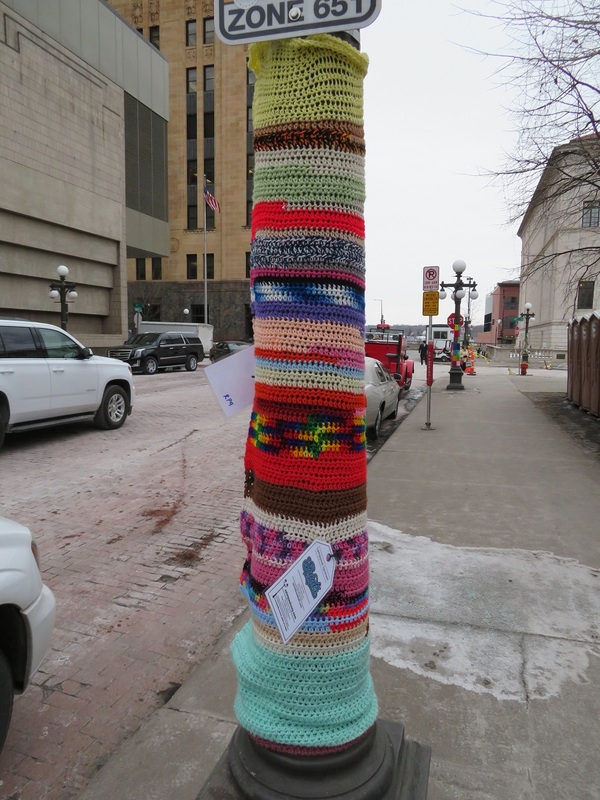 In what some have mistaken for a cozy act of civil disobedience, a coalition of self-described “yarn bombers” brazenly decorated light poles and street fixtures by St. Paul’s Rice Park and up and down Fourth Street on Sunday, directly in front of the Ramsey County Courthouse and St. Paul City Hall. 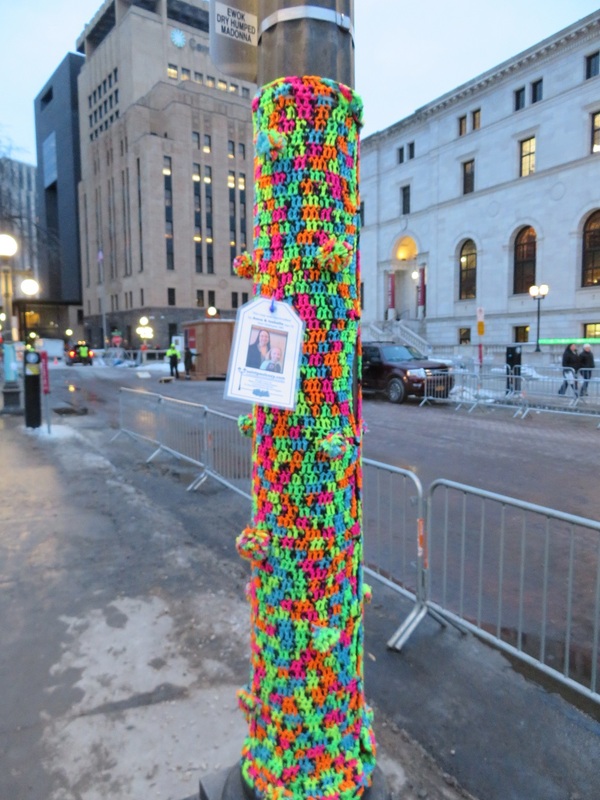 The yarn vigilantes signed several of their elaborate knit creations by adding laminated labels with their names, hometowns and even pictures of themselves, revealing a widespread network that stretches from the capital city to Embarrass, Minn.
On social media, at least one yarn-bomber pledged to continue to wrap light poles with knitting this week. The yarn work is led by the “Rage to Order Artists Initiative” of Lowertown, with support from the St. Paul Saints Art Program and a series of sponsors, including St. Paul and Ramsey County. The goal is to wrap 158 lamp posts along 12 downtown city blocks from Rice Park to CHS Field and keep them on display into March. Check us out in the Pioneer Press! We are thrilled by the outpouring of enthusiasm for this project! 115 participants have signed up to make a cozy, which means we are 70% of the way to our goal of dressing 158 lampposts. 2 completed cozies have already been submitted! 45 participants have joined the “Saint Paul Cozy Makers Group” on Facebook and are sharing helpful tips and awesome in progress photos. There is photographic evidence that at least 5 cats are “helping” with the project. We’re building a community of Cozy Makers, online and IRL! The Cozy Team will be hosting “Meet and Makes” at Hygga Lowertown on Wednesdays and Saturdays from Nov 29 – Jan 17, 2018. Bring your supplies, grab a beverage, and enjoy some good company. See the Cozy Event Calendar for more details. Maker Registration is Now Open! and cheer to Downtown St. Paul this winter. 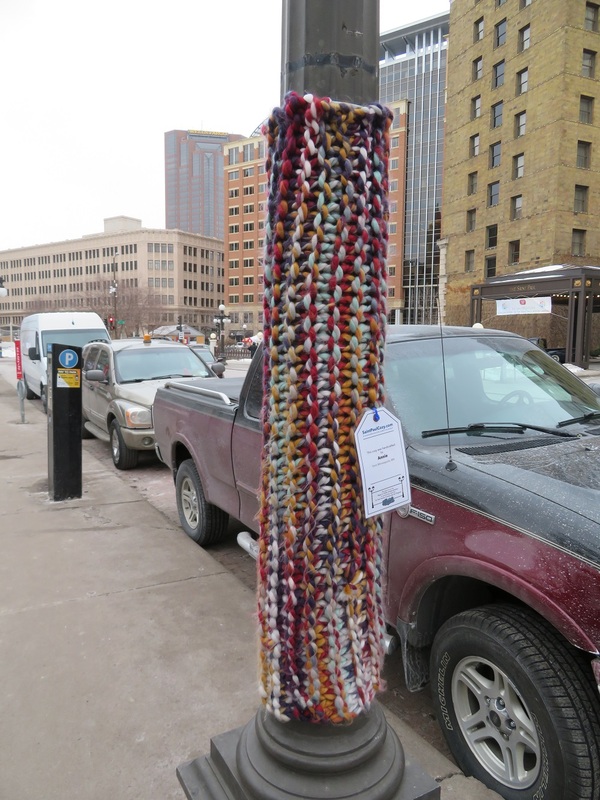 Led by the Rage to Order Artists Initiative of Lowertown, Minnesota artists and crafters are invited to crochet, knit, weave or quilt a lamppost “cozy”. The cozies will be installed along 12 blocks of 4th Street from Rice Park to CHS Field prior to the Winter Carnival and will remain up through the month of February.